The Act of Lamentation - The Simplicity of Truth. The human need to publicly convey expressions of denial, anger and outrage – all characteristics of the grieving process – contrary to historical practice, remains an articulation that in a Western configuration of the processes of grief, are hastily relegated toward that of a more private sphere of emotional outpouring. And yet it could be convincingly argued that the private made public is the civic responsibility of each individual throughout an individual’s surmounting of discordant emotions that have been equated with those of a post-traumatic stress disorder. Put simply this action equates with a healthy society knowledgeable of the dynamics that operate around inclusion as opposed to the exclusion currently afforded grief and the grieving individual. Throughout the contemporary Western post-humanist framework of grief, death has become a subject of social taboo. With the illusion afforded to thoughts of a technological utopianism, death has in effect become strangely anachronistic. The levels of unreality that seemingly blanket this very real inevitability feed into a belief of the prevailing of scientific and technological developments in overcoming the inescapable consequence of life. What has been made publicly allowable with the exception of a masculine appropriation – as a political and social resource – of a collective grieving and remembrance afforded to past wars and the death of celebrated statesmen, sportsmen and the occasional women, the battle between the demarcation of the public and private forms of expression, between what is considered acceptable and that which is deemed profoundly unsettling has been lucidly articulated by emerging artist Karike Ashworth throughout her most recent solo exhibition titled Lamentation. Ashworth’s Lamentation marked the two-year anniversary of the passing of her mother in May 2012. The exhibition conveys the collective grief of twelve women including the artist who have all lost their mother to death. A celebration of life viewed through the lens of artistic contemplation? Perhaps, though one is drawn to a speculative rending of the mind and body in the face of a perceived culmination of events amounting to the sublime certainty of finality. It is a dialogue that as a society we tend to dismiss. And yet framed as artistic eloquence in a recognisable public space, a space in which dialogue is encouraged and permitted to take shape, enables the viewer to constructively consider the many complexities surrounding the human inability to explore the absolute certainty of our collective demise. To investigate ideas that oscillate between the felt pain of a certain vacancy and a remembered presence underscored by a seemingly insurmountable grief, Lamentation, invites the audience to share in this uniquely feminine witnessing to a mortal absence and promotes a rare opportunity to bear witness to the coherently focused intent of the artist at work. The exhibition allows a clinical meditation on the inevitability of iniquities that are and can continue to be perceived and felt as a result from the death of a loved one. And whilst art as therapy has its place, Lamentation professionally elevates through an almost ritualistic symbolism, a feminine value as the traditional gatekeepers of the grieving process. We cannot help but feel the authority afforded memoir as a form of authenticating life. It is an exceptional collection of a feminine history that coalesces toward a decidedly productive exegesis allowing the opening of a much-needed dialogue that we all in some way personally share. The transfiguration of a life lived disseminated throughout that of a contemporary artistic practice. This aesthetic strength and iteration of the Minimalist lexicon harnessed by Ashworth is clearly echoed throughout the entire exhibition. When we critically look at and ruminate over for example Epoch, there exists a residual trace of a discrete disruption between a perceived heterodoxical sense of space, artistic discipline and gender values. 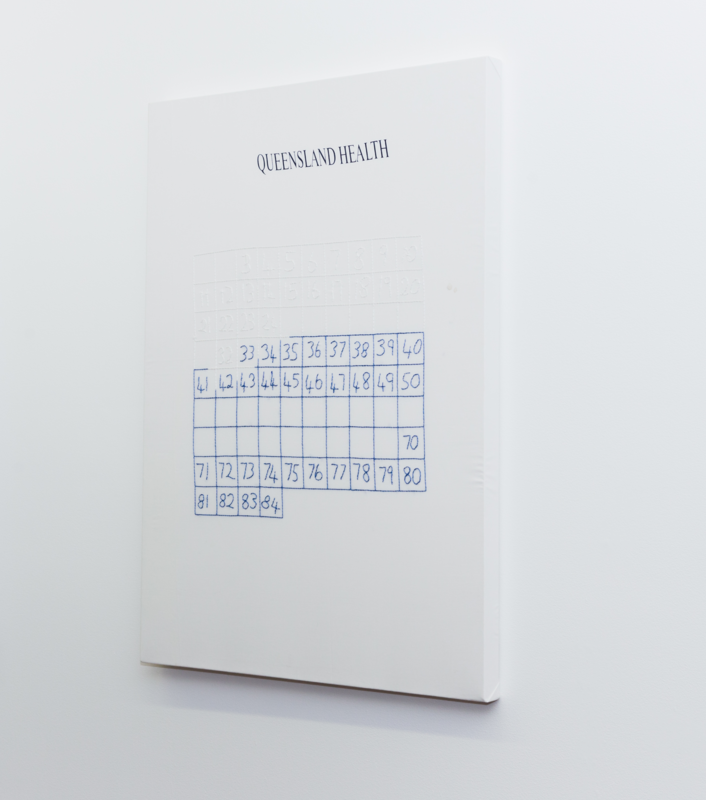 On one level what we are looking at are a series of twelve personalised, numbered and darned calendars tracing the mother/daughter relationship from the birth of the daughter through to the death of the mother. Darned in the colours of the Queensland Heath brand, each square is representative of a year. These calendar grids, interspersed with numbered blue squares – evocative of the years that held the memory of traumatic events throughout the mother’s life – are reinterpreted and re-signified artistic triggers that collapse a life lived into a hyper rationalised form. This indexical reproduction of a life is redolent of a mathematically accurate statistical portrait, or at the very least, an obsessively abstracted rationalisation of mortality. In essence, Epoch can be seen to be in conversation with, for example, Carl Andre’s 144 Magnesium Squares though perhaps more accurately the overarching masculinity of Minimalism and perhaps more abstractly the entrenched masculinity evocative of the overall art’s industry. From the form and materiality of the object: the choice of mediums and obvious hand of the artist: from the destabilisation of the horizontality of the floor onto the verticality of the walls and into the same fabric that all of the women represented had at some stage engaged with, are all staunchly provocative artistic gestures by Ashworth. An immediate dialogue not only with notions of a shared grief and remembrance but as we begin to peal back the layers of this particular work the foundational elements of which intensify toward a conversation between the feminine and the masculine. An intriguing and ongoing conversation between the traditional feminine provenance of the grieving process, the overt masculinity of the art-world – in particular the prescribed evaluations of Minimalism, the indexical significance of the grid and the mathematically magical symbolism of the square. Ashworth’s artistic process sets up a dynamic that contests a masculine dominance of public space. She utilises the gallery space, the traditional domain of a mostly masculine fraternity and through a distinctly feminine artistic intervention that whilst remains in conversation with understandings of the histories of art and pays a meticulous attention to a detailed investigation of space, Ashworth consciously destabilises that space and displaces it with a Minimal, ritualistic iconography. The public and masculine are diverted toward a feminine unsettling of this tradition with the paradigm growing as the public gallery begins to signify the private space of a shared feminine grief, the sharing of an immense rationalisation of death. Arguably it is the mother daughter bond – whist extremely complex and at times mercurial whilst at others provocative and loving – that remains of paramount importance throughout Lamentation. And it is this maternal bond that is holistically present across the entire exhibition. 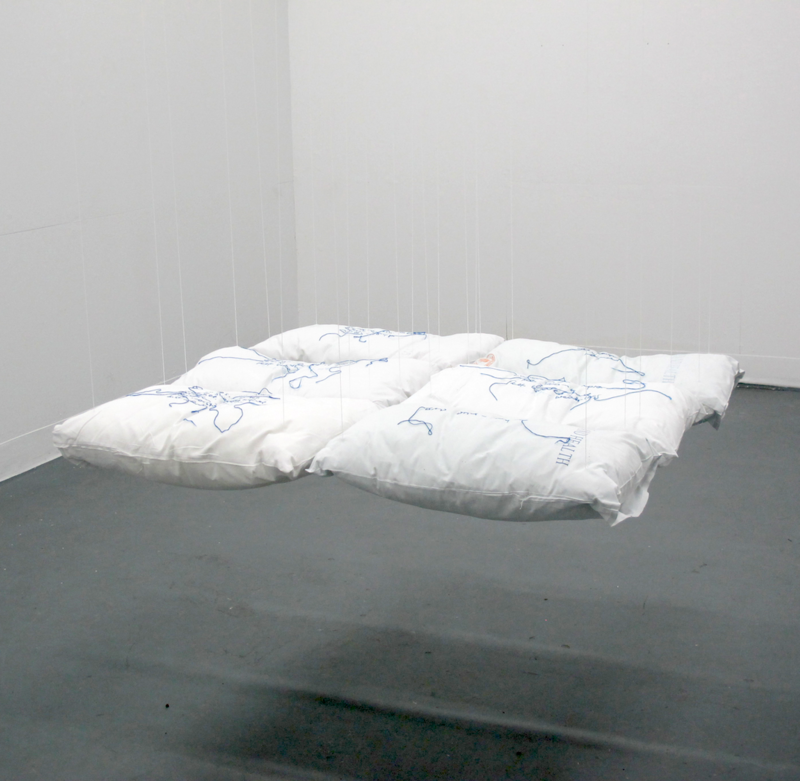 Strongly felt and clearly seen in Ashworth’s Pillows: once again we are looking at a grid of condemned hospital linen, however this grid of covered pillows is suspended by a series of infinitely thin lines. Liberated from the floor Pillows looks both inviting and yet vulnerable in its suspended fragility. The slips are darned with fluid snippets from her mothers diary in her mothers hand. The dream keepers: Pillows allow an authenticated intimacy into a fragmentation of past thoughts. And yet it is a suspended intimacy that oscillates between the dichotomies that exist within the humanist construct of certainty. All threatening to collapse under the weight of a seemingly tenuous hold on life, once again the auraratic presence is fore-grounded throughout the form of Pillows. A Minimalist shrine to the authenticity of both life and death, Ashworth captures the moment when life transitions toward an eventual state of death and beyond toward the suturing of the body post mortem. The perceived violence and aggression of suturing post mortem is clearly counterpointed by the loving tenderness exhibited throughout the processes of darning highly personalised fragments of a memory past. This emotive tension lends itself to the validation of a felt feminine aura. Pushing outward from the centre of the small room, the intimacy of Pillows also seems a recognisable felt presence. As we move around the three dimensionality of the soft sculptural object, a spatial reorganisation of that which has been displaced must in some way be rationally accounted for. In a sense it is the viewer who absorbs any spatial absence. The immediacy of its physicality is artistically laser focused. In many ways Pillows and for that matter Lamentation is a deeply personal display of grief and the stages of reconciliation an individual navigates in reaching some form of acceptance of the inevitability of death. The exhibition is a Minimalist, tactile, audio-visual accompaniment to the conceptual interest Ashworth vocalises in her questioning of certain canonical artistic standards, questions that unfortunately still need to be asked. Lamentation engages with notions surrounding ‘first world’ arts and its offshoots as being solely responsible for the enacting or the reenacting of social tragedy. And if this is the case is it enough of a societal valve to assuage private expressions of grief? Whilst bearing witness to a shared feminine grief in a public setting leads toward an important reintegration toward the matrix of existence, Ashworth’s constant probing of the feminine and masculine roles inherent throughout the grieving process, divulges a difference through which gender roles begin to separate. Traditionally the provenance of the feminine, Lamentation exhibits a clinical finesse of form, media and medium in interlocking the cyclicality of the prevailing narrative. 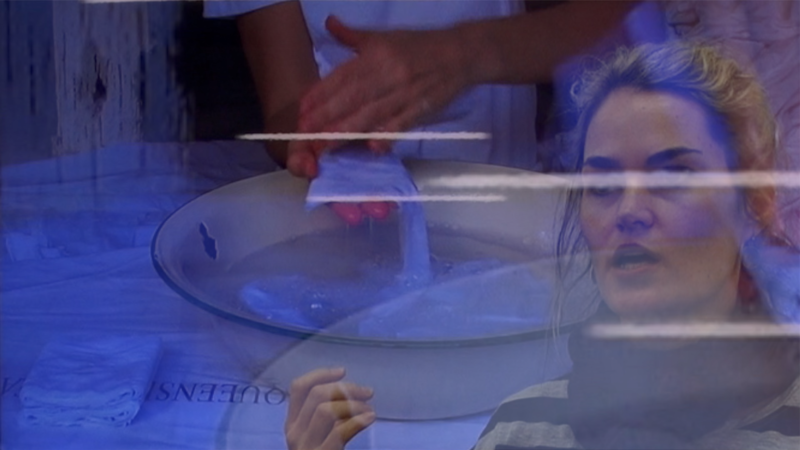 The hyper hygienic parallels that run between that of the contemporary art space and that of the hospital system have become unsettled via the introduction of condemned hospital linen into the sanitary surrounds of the gallery setting. The aesthetic intervention of which is subtly compounded through a variety of engagement strategies. The visual dialogue, the historical dialogue, the verbal musing, Ashworth’s rationalisation of space and form and a fearless pursuit of a truth that bleeds into social taboo, are some of the keys that can be seen to unlock this exhibition. In a sense we enter the displaced space of mortality that is constantly unsettled by an implied viewpoint. And yet it’s elements of bodily penetration, absolution, suspension and rending, that are all evocatively visceral elements of an extended hospitalisation, that we as viewers move through. These extraordinarily powerful, symbolic gestures navigate the borders of several discourses, weaving threads from each into a highly personalised indexical expression of a feminine value: a Minimalist exploration of a series of feminine gestures that surely points toward an overarching simplicity of truth. The act of lamentation – the sound of trauma – is by all accounts an outward expression of grief, a passionate articulation of mourning, of loss, regret and sorrow. It is an act that has for millennia transgressed borders, religious belief, cultural affiliations and pertinent to this article, artistic disciplines. 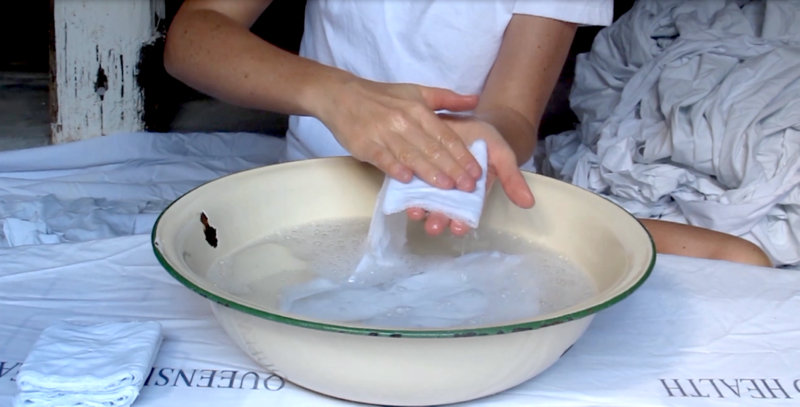 The artist gently and meticulously washes and strokes a strip of hospital sheet for 14 minutes. The cleaning mimics the usual handling of hospital linen as it are processed through the hospital laundry system, and also the care and concern hospital nursing staff show to tend their patients. The artist hums softly to herself and we have the sense that we may be witnessing a private moment, of reflection perhaps. There is strong connection between the treatment of the sheet-strip and the cleansing and preparation of a body for burial. 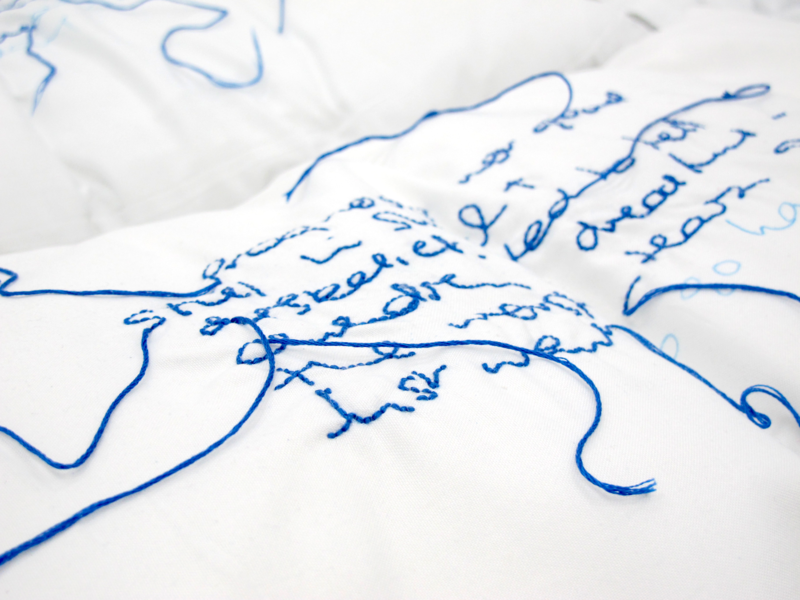 Header Image: Karike Ashworth, Pillows, condemned hospital linen, thread. Dimensions: 6xobjects @ 15cm (H) x 68cm (W) x 40cm (D), 2013. Music Courtesy: Per Olov Kindgren, Entree in G-major, Silvius Leopold Weiss. Sontag, Susan. Against Interpretation. Farrar, Straus and Giroux, 1966. Burton, Laini. Karike Ashworth Lamentation Panel Discussion. Chaired by Louise Martin-Chew, featuring Dr Bill Platz, Dr Courtney Pederson and Dr Laini Burton. The Hold Artspace. You can view the discussion here. Chave, Anna C. Revaluing Minimalism: Patronage, Aura, and Place. The Art Bulletin, September 2008. Leonard, Sarah. Death and Das Man: Authenticity in Heidegger’s Being and Time. University College London. April 2004. Botton, Alain de. Heidegger In the Kitchen. The School of Life. September 16 2014. In conversation with the artist. Connelly, Robert. Living With Death: The Meaning of Acceptance. Journal of Humanistic Psychology, 2003. Zittel, Shabby Clique, Artforum 42, no. 10 (Summer 2004): 211. 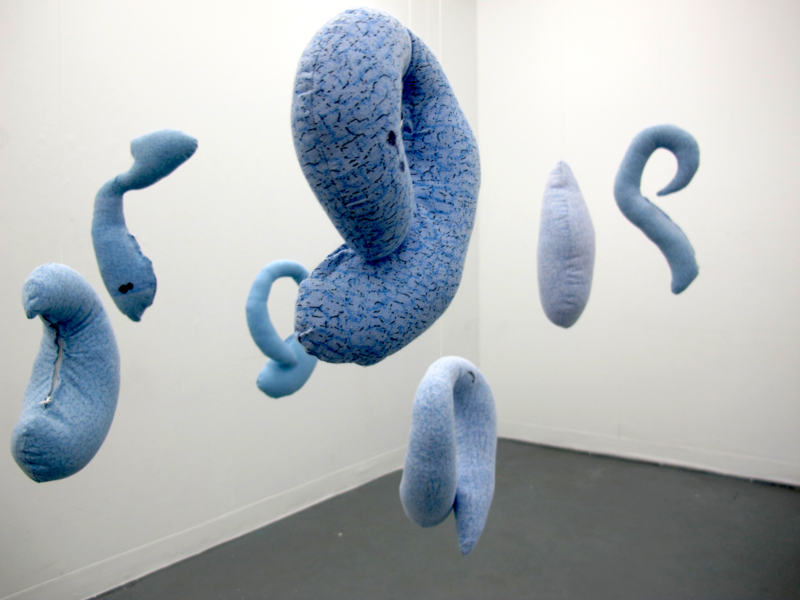 Karike Ashworth: is a multidisciplinary artist living and working in Brisbane. Her creative practice consists of time-based media, text, objects and installations. Her areas of interest include social practice, collaboration and the private-made-public. These broad areas of interest frame her more specific concerns with the way mutual implication, ambiguity and social discomfort in contemporary art can disrupt normative enculturation and/or aggravate the social conscience. Karike graduated from the Queensland College of Art in 2013 with a Bachelor of Fine Arts where she was awarded the Godfrey River Medal for outstanding studio performance and was a finalist in the Graduate Art Show (GAS) at Griffith University Art Gallery. In 2014 she completed Honours in Visual Arts at the Queensland University of Technology (QUT) with First Class Honours and was a finalist in Excerpts: Visual Arts Showcase at The Block. Karike is a current PhD candidate in Visual Arts at QUT, investigating the strategic use of social discomfort in contemporary practice. 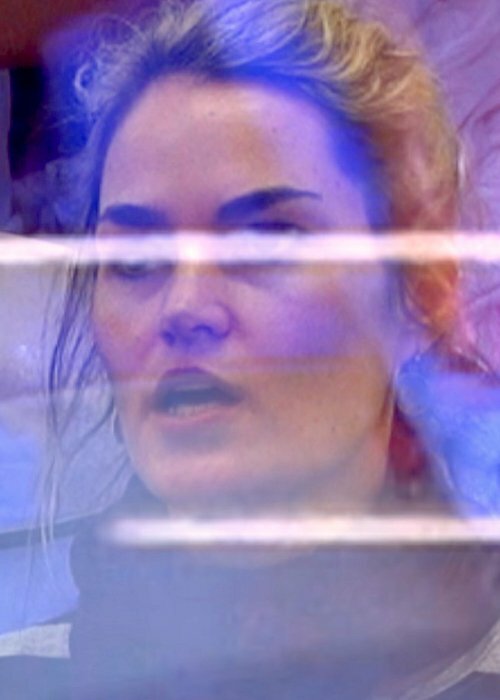 Image: Karike Ashworth, Detail, Lamentation, HD video still, 2014. Karike Ashworth is a multidisciplinary artist living and working in Brisbane. 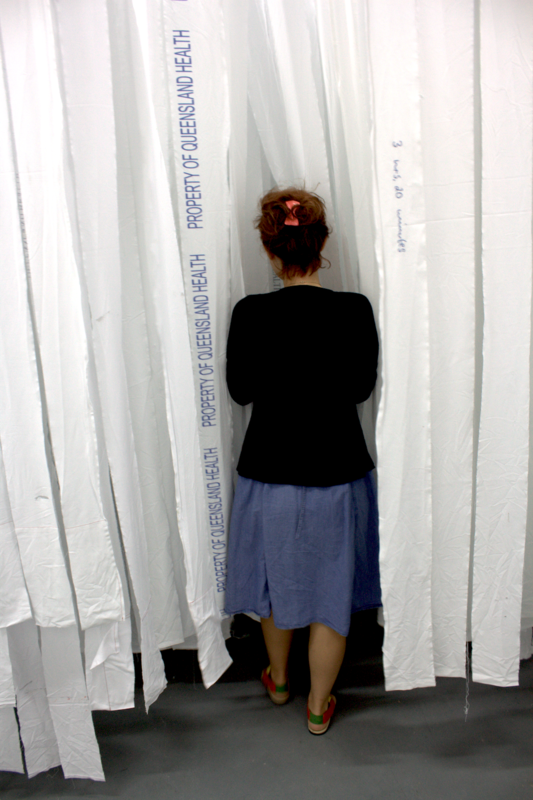 Her creative practice consists of time-based media, text, performance and installations. 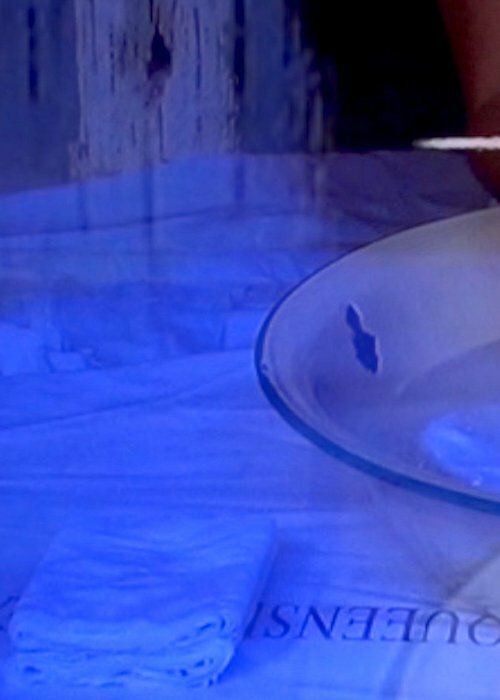 Image: Karike Ashworth, Detail, Lamentation, HD video still, 2014. Karike works for Museums & Galleries Queensland as Membership Officer to Public Galleries Queensland and Museums Galleries Australia Queensland.